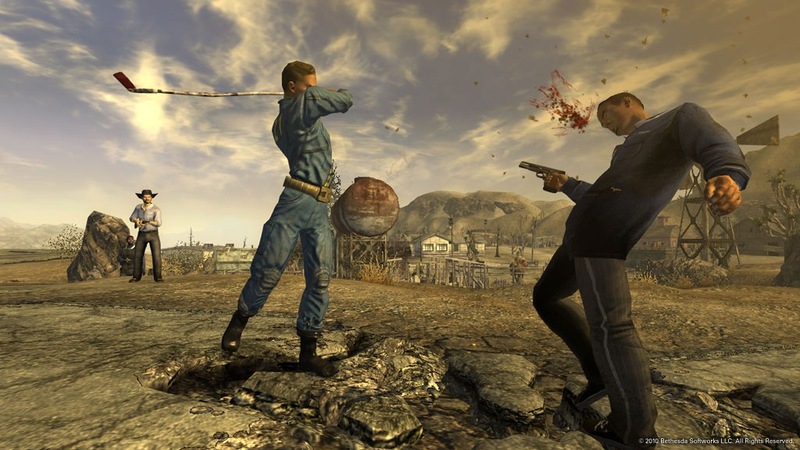 Since I was a fan of Fallout 3, it was kind of predetermined that I would probably enjoy New Vegas – and enjoy it I did, but is there enough new here to make returning to the post apocalyptic world worth your time? One of the biggest changes, for me, is the tighter focus. Normally I would see this as a bad thing but here Obsidian Entertainment has used it to breathe more life into the game. The NPCs are fewer but they each seem to have a purpose and a story. One of my favorite stops is Novac, with it’s mascot Dinky. There are a number of interesting NPCs but one in particular has a issue that can be solved many different ways. A sniper’s wife is missing, and he tasks you with finding out who took her and putting them out in from of his sniping post so he can kill them. This can be your opportunity to off anyone you want, or you can try and help him. The path to the truth is winding but can net you a companion. Unlike Fallout 3’s out-of-control companions, folks you pick up in New Vegas are controllable via a radial menu and they provide perks to the player. My favorite buddy was the punch-happy Veronica. She was extremely destructive and freed me up to shoot from range while she punched the hell out of everything. 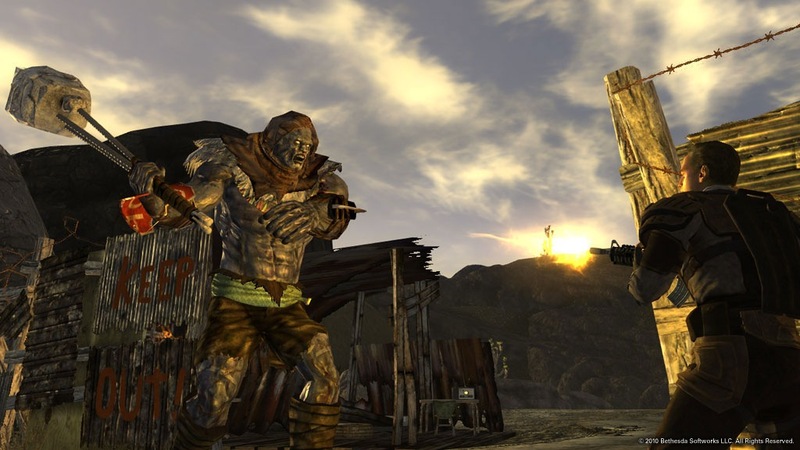 Graphically Fallout: New Vegas looks like an expansion to Fallout 3. The visuals are only modestly altered so don’t expect anything outstanding. The voice work seems to be more solid this time around. Even though it wasn’t bad in the previous game, I think I prefer the work done here. There are technical issues (it is built on a Bethesda engine, after all), including dead baddy body parts getting getting stuck in scenery, causing them to gyrate wildly. Crashes aren’t too prevalent but still exist. Betasim had to disable the ffdshow video codec for the game to run for her, even though I had no such trouble on the same computer, so stability can be an issue. I think that, if you liked Fallout 3 you’ll be in love with New Vegas. The world is richer, the stories are better, and c’mon… it’s Vegas, baby! Hit up the New Vegas casinos and see if your luck holds out in between dispensing your own brand of wasteland justice. This is one dystopia I don’t mind coming back to. Alphasim out.